About the Book:Do you feel like you’re drowning in the everyday stress-pool? . . .
Don't Miss this Give Away! 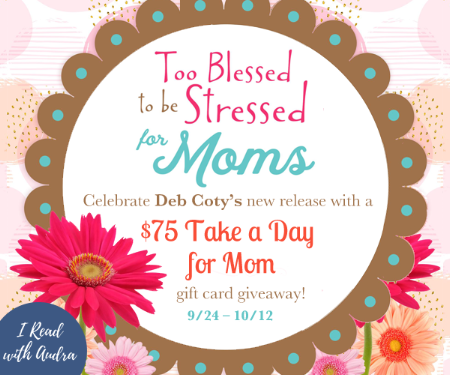 Too Blessed to Be Stressed for Moms is such an amazing tool to help moms that is applicable to a first-time mother with a new born baby or a mother with numerous children. All moms can relate to the stress of children. This book is for you! The author is spot on with scripture, humor, quotes and content that makes the reader feel as though she isn't alone on the journey of motherhood. This book will make you feel as though you are on a journey together in motherhood and that you aren't in the chaos alone. Being a mom isn't easy and is often over looked in our society, but Debora recognizes how being a mother is such a unique gift and calling. She instills that into the reader and she welcomes each mother at the beginning of each devotional which I love, no matter how your day has been. This is such a great little encouraging devotional. I just enjoyed this book. I highly recommend you getting a copy for all the moms in your life. They will enjoy this book, I promise! I highly recommend Too Blessed to be Stressed for Moms out there. Be sure to get grab your copy today. I received a complementary copy of this book. This review is my honest opinion. I give it 4/5 stars.